Devraj Dakoji was born in 1944 in Hyderabad, Andhra Pradesh. 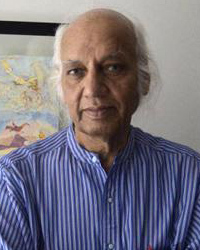 He graduated from the College of Fine Arts and Architecture in Hyderabad in 1965. Lalit Kala Akademi (Andhra Pradesh) gave Dakoji a scholarship to attend M.S. University, Baroda where he studied printmaking. In 1975 Dakoji received the British Council scholarship to attend the Chelsea School of Arts, London for his postgraduate studies. From 1976 -77, Dakoji travelled extensively in England and Europe. In 1991 Dakoji was appointed Commissioner and jury member for the 2nd Graphic International Print Biennale, Bharat Bhavan, Bhopal. In 1992 he later joined the Tamarind Institute, Albuquerque New Mexico U.S.A. He has also been Chief Supervisor and Programming Officer of Garhi Studios, Lalit Kala Akademi,New Delhi. A central part of Dakoji’s art is a belief in the unity of the created world, where all creation has equal status and importance; Nature in its entirety has always engaged his creative expression, his canvases populated with rocks, birds and animals. Dakoji restores to our understanding a universe that is charged with energy and mystery. It is interesting to see how his vocabulary has enlarged in his watercolours and drawings, where figures have begun to play a more significant role. In his watercolours shown at Art Heritage in his solo exhibition “Wheel of Life” (2012), Dakoji used the symbol of the bird on a bicycle in flight. Devraj believes that “The moving wheel represents the life force in living beings. One wheel is ourself, the other wheel is spiritual energy.” His fluid landscapes reveal a world where mythic creatures dance with abandon and in celebration. It is interesting to note that a new icon of a bearded man and a horse (presumably M. F. Husain and his famous horses) have joined Devraj’s pantheon of emancipated creatures. Dakoji belongs to the period of the 1970s when a lot of definitive work came into its own paving the way to modernity in Indian art. The scene was robust with groups and collectives trying to push the frontiers and Dakoji within a few decades, in 1996, along with his wife, artist Pratibha, set up Atelier 2221in Shahpur Jat, Delhi, the only independent edition-making studio in India at the time, Here artists working in different mediums could come, work and collaborate to produce prints. Dakoji has received recognition and awards that include a Gold Medal for Graphics, Andhra Pradesh LKA, 1975; Lalit Kala Akademi National Award for Painting, 1983; and most recently he has been nominated for the 2015 NYC Creating A Living Legacy Program, Joan Mitchell Foundation.